On the 6th of September 1944 at 13.23 the 1st Armoured Division crossed the French-Belgian border in a victorious pościgu after defending themselves zaciekle German troops. 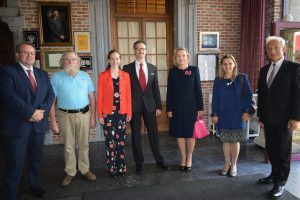 On the 6th of September 2017, exactly at the same hour, in one of the first liberated Flemish towns – Adegem – in presence of Mrs Senator Anna Maria Anders, Minister for International Dialogue, Mrs Joanna Doberszyc-Toulsaly, vice-ambassador of Poland in Belgium and Mr Gilbert van Landschoot, owner of the Canadian-Polish Museum in Adegem, Jerzy Samborski, author and leader of the program „Liberation Route of the 1st Armoured Division of general Maczek” performed its official inauguration. The aim of the program is to recall to national and European memory the Polish input in liberating Europe from German yoke. Promotion of a spectacular, victorious campaign of the 1st Armoured Division led by general Stanisław Maczek, is undoubtedly the best way to achieve this aim. 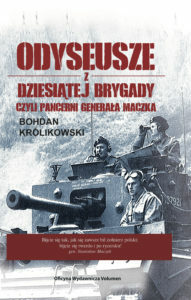 That is why as part of the program will be realized such project as publishing tourist-historical guide consisting of information about 100 towns in France, Belgium and the Netherlands, liberated by the 1st Division, creating a mobile application, organizing Battlefield Groups and a great annual rally in Adegem in September 2018, exhibitions in Warsaw and other cities. Honorary Patronage over the program was accepted by Minister Anna Maria Anders, readiness to further collaboration were declared institutions such as: embassy of Poland in Belgium, Representation of Flanders in Poland, TVP Polonia, Central Military Library and many other organizations and institutions.